A shower feels good any time of year. But in the winter—especially when it's 15 degrees below zero outside as it is this morning—sometimes a good hot shower's the only way you can reach that chill that's penetrated to your core. This morning I'm taking one of those showers. I let the water run until the glass steams up. How relative the heat is. When I first step in, I have to quickly turn the handle down to avoid burning myself. But in no time it feels tepid; I turn it up. By the time I'm "cooked," I've done so several times, to the point where the water's now much hotter than it was at first when I couldn't stand it. Now my skin's turning red—brightest on top of my shoulders, with definite streaks where the nearly scalding rivulets run down my chest. The meditation's put me in touch with something very basic, very pure. A celebration. I am deeply warmed in body and soul. I play with the tickling jets of water, testing the effect of each on a pruning fingertip. Of the hundred or so strands the shower head dispenses, no two are alike. Some are focused and fierce, biting into my skin; others I can barely feel. Some subdivide their meager share into still finer spray; a few barely drip, choked off by years of lime deposits. I feel my back cooling. I experiment, and finally perfect a sort of "rotisserie" movement, gradually turning my body while rocking slowly back and forth. That's more like it. After a while, I realize I've indeed lost track of time—in fact, of every thought. The meditation's put me in touch with something very basic, very pure. A celebration. I am deeply warmed in body and soul. I turn off the water and reach for my towel. 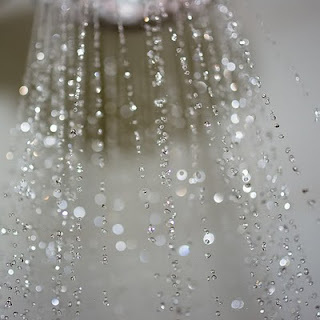 The shower head gurgles as it drains. Each drop clips the gray rubber edge of the shower squeegee hanging from the shower caddy and deflects out at my chest. They're cool, but it feels good.